Book - Paperback 4"x6" Pocket Pal really fits in your pocket! Biological nutrient removal (BNR), the removal of nitrogen and phosphorus from wastewater, is a complex process. Although the activated sludge process is an efficient technology for the removal of biochemical oxygen demand (BOD) and total suspended solids (TSS), it provides less-than-optimal conditions for the removal of nitrogen and phosphorus, and presents numerous challenges to the operator trying to satisfy the many requirements for several different groups of bacteria. In addition to satisfying the requirements there are numerous, highly variable operational conditions that impact BNR. These conditions include: changes in strength and composition of the wastewater, alkalinity and pH, temperature, and presence of inhibitory and toxic wastes. Even fluctuations in flows, especially from inflow and infiltration, can adversely impact the aerobic, anoxic, and anaerobic conditions needed for successful BNR. Of the three treatment processes, nitrification, denitrification, and enhanced biological removal, nitrification is often the most difficult to achieve. Therefore, a large portion of this book reviews nitrification. 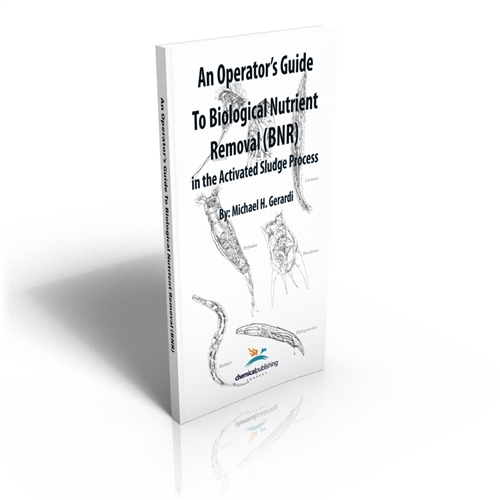 Operators of the activated sludge process need to understand the basic biological, chemical, and physical requirements for BNR in order to improve the performance of these treatment processes. An Operator’s Guide to Biological Nutrient Removal (BNR) in the Activated Sludge Process is intended to help operators in the monitoring, troubleshooting, and process control of BNR. Numerous tables and figures are included in the book to help the operator understand the biological and chemical reactions that are involved in BNR processes and how the reactions can be monitored for process control.